In August 2007 an earthquake measuring 7.9 Mw hit the central coast of Peru resulting in the deaths of over 500 people and the destruction of more than 60,500 homes. Further up the coast, towns and cities were told to prepare to evacuate as they suspected that the earthquake would create a deadly tsunami. There were even warnings as far off as Hawaii. Many in northern Peru rushed back to Lima and beyond to check on family members, many of whom could no longer be contacted by phone. The one highway was packed both ways with those rushing home and others rushing out of the capital to escape what they feared would be equally strong aftershocks. Though many in the north started to pack and the wealthy readied their vehicles, there was little to no movement. Those with international news channels sat watching CNN for reliable information. On April 1st an earthquake of 8.1 Mw hit the north coast of Chile resulting in the deaths of 6 people and damage to over 9,500 homes. 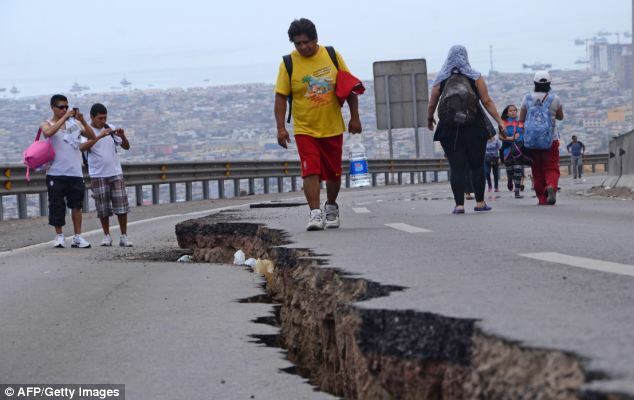 Along the western coast of South America, towns and cities were told to prepare to evacuate as it was suspected that the earthquake would create a deadly tsunami. There were even warnings as far off as Mexico. In Peru’s coastal towns most people carried on as normal. This earthquake had taken place in a different country and after all, they had been told to evacuate before. Some laughed as the ‘tsunami’ constituted a wave 2 inches larger than normal. But in northern Japan waves of 40 cms higher than normal were recorded. Fortunately the earthquake this week had a much smaller impact on the lives of Chileans than the 2007 quake had on Peruvians, partically in Ica and Pisco. However, there is one potentially deadly consequence of the events of this past week. Following two false warnings and the tiring energy that it takes to prepare your family for evacuation, the worry of where you will go, how you will get there and for how long you will have to stay, will Peruvians and Chileans take future warnings seriously? Information is power. Few have access to the scientific knowledge and technology to predict natural disasters and it is recognised that the information we do have is not always perfect. It is the role of those who have the information and the knowledge to interpret it to share that with affected populations, but how can we avoid ‘the boy who cried wolf’ dilemma endangering people in the long run? *This title refers to Aesop’s fable but does not mean to infer that those with the information are intentionally crying wolf, but rather that we need to be aware of the end of this fable. ← ‘Integrated nutrition programmes’ are a great idea. But do they work?